Printer: F. W. Potter & Co. 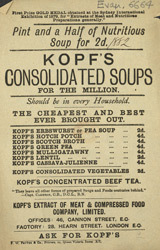 Beef extract or beef tea was a popular drink during the 19th century. It was non alcoholic and very nutritious and was good for children and invalids. Poverty was widespread at the time and many people could not afford to buy good quality meat or vegetables, eating foods like Kopf’s extract of meat would have provided much needed nutrients at affordable prices. Soup on the other hand was not so popular with the working classes as often they did not have the money to buy cooking equipment or utensils.